MORIKAWA CHIKASHIGE was a pupil of Kunichika and very little is known about his life or background. Some researchers have claimed that he lived from 1835 until 1900 but it is my belief that this is only a theory as I have never seen any factual evidence of this. What has been documented is that virtually all of his known work was created between 1869 and 1882. FOLLOWING ARE TWO RECORDED WORKS OF MORIKAWA CHIKASHIGE WHICH HAVE BEEN DATED. 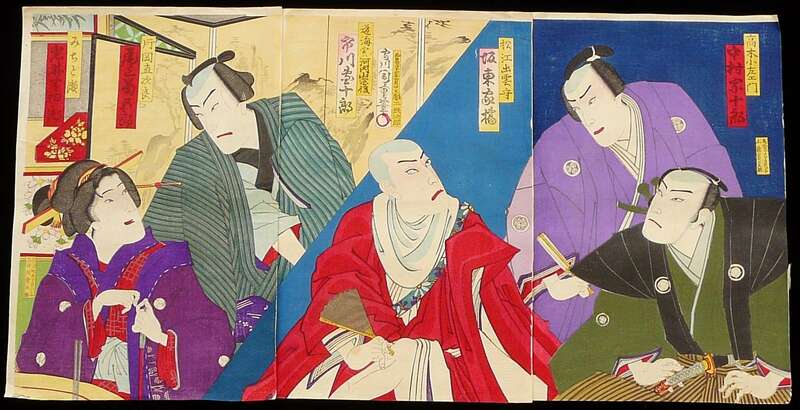 Morikawa Chikashige: #P2815 FINELY MADE TRIPTYCH SHOWING PORTRAIT SCENES OF KABUKI ACTORS FROM THE 1870s. THREE UNATTACHED PANELS. 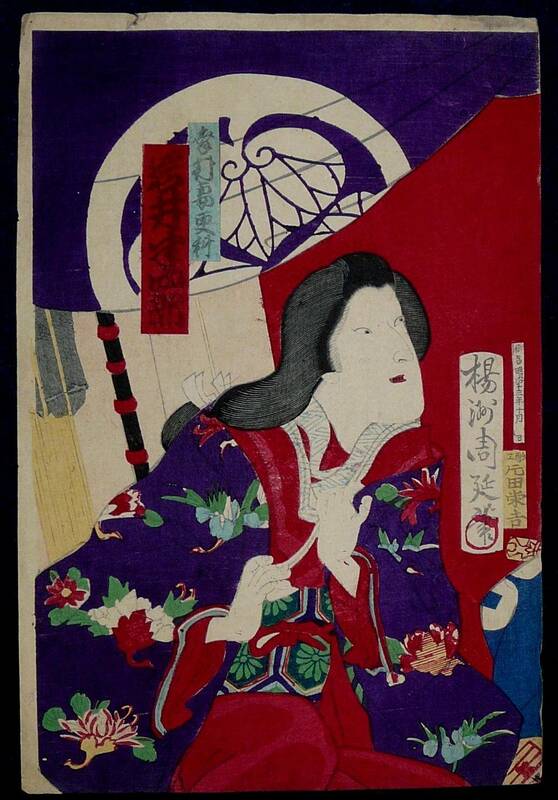 SIGNATURE: Ichikawa Chikashige Hitsu with the Red Seal Below on the central panel. CONDITION: Good for Age – see photo. SIGNATURE: Ichikawa Chikashige Hitsu with the Red Seal Below in Right of Scene. I AM HOPING TO FIND MORE EXAMPLES ON MY NEXT TRIP TO JAPAN.